1 cup chopped honey dew melon from the 1/2" close to the rind, with the very thin, actual rind removed. NOTE: In the photographs, I made a 1/2 recipe set in a 1L glass container. However the ingredients are for a full 9" springform pan with ~2L capacity. Pour 1 cup sugar and 1/4 cup water in a very small saucepan, and using a candy thermometer, boil until 235F. Very gradually add the honeydew; every addition will cause the temperature to drop, try to keep the temperature constant. Once all the honeydew has been added, keep at 235F until glassy (5-10 minutes). Drain excess syrup. Optionally if you have a convention oven, place candied melon on parchment or wax paper, and in the wind of the convention, heat to 250F for about 5 minutes. Refrigerate. Beat eat whites until fluffy. Beat egg yolks until thick and pale, then beat in sugar, and then Marscapone. Lightly soak bottom half of savoiardi in Midori and water mixture. Don't overdo it! Spread one layer savoiardi, one layer cream, one layer savoiardi, one layer cream. Sprinkle with the remaining pistachios. 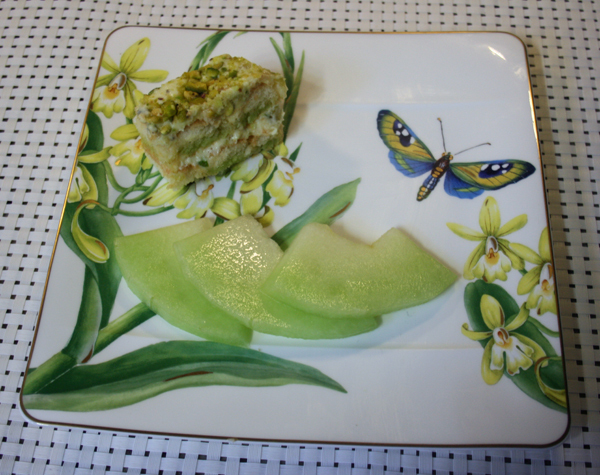 Refrigerate overnight and serve with fresh Honeydew melon.